Part of being prepared is being educated. It's a good idea to know how to turn off your gas in case of a gas-leak, which can happen at any time, but may be more likely in an earthquake. You should store a wrench next to the gas meter or in an easily accessible location so that you can turn the gas off if needed. 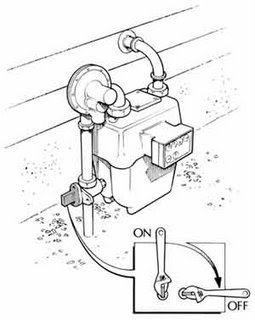 If you determine that you need to shut off your gas, simply turn the valve one quarter-turn with a wrench (as shown in the diagram above). You can significantly reduce the likelihood of a gas leak in an earthquake by securing your water heater. Water heaters often rock loose during and earthquake and sever the gas connection.